BBa_J23106 is a constitutive promoter constructed by a previous iGEM team. We wanted to establish whether this promoter would be suitable for use in our non-model organism chassis Clostridium difficile, and also wanted to put the strength of this promoter into context by characterising fluorescence using the iGEM Interlab calibration curves, and also compare its strength to the Interlab positive and negative controls. 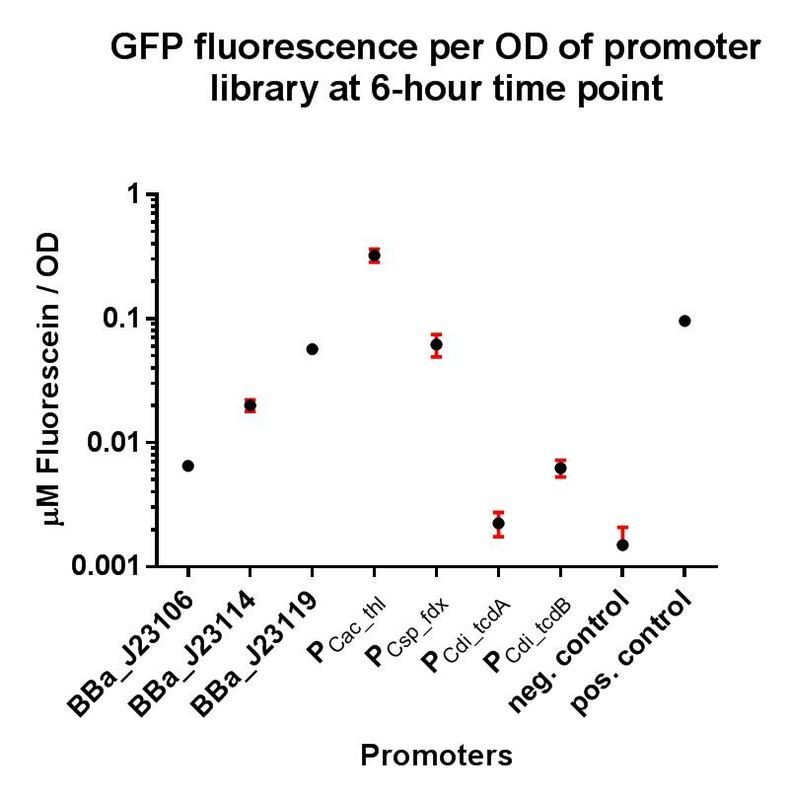 The construct BBa_K2715106 allows us to characterise this promoter more extensively in E. coli with a standardised and reproducible measurement of fluorescence. Additionally this promoter was characterised in C. difficile using the gusA biobrick BBa_K330002 as a reporter gene in place of GFP, as GFP requires oxygen in order to function, and C. difficile is an anaerobic organism. 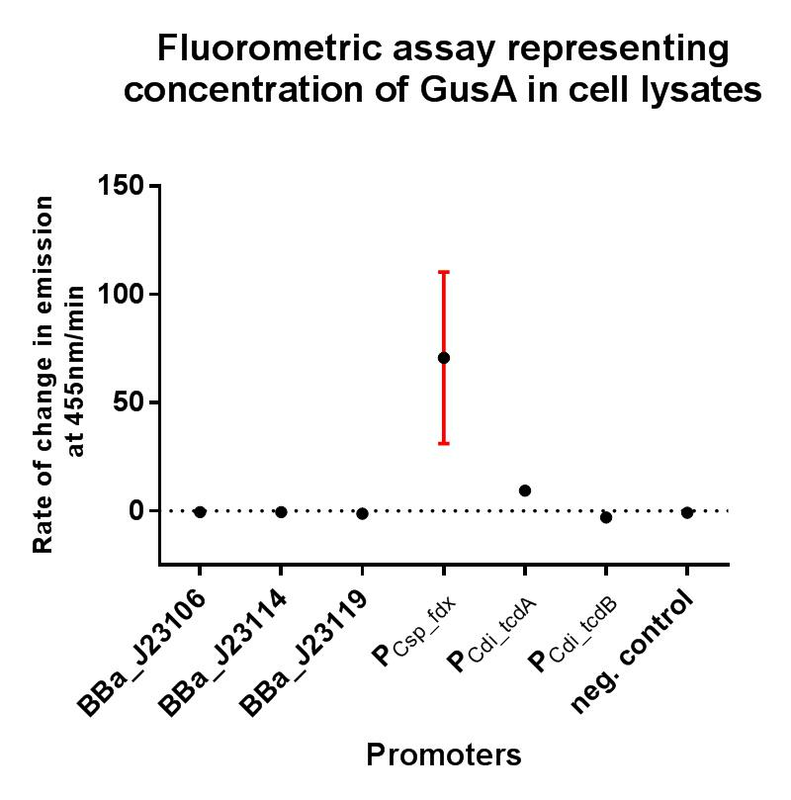 The gusA containing composite used to assay the promoter activity in C. difficile is BBa_K2715025. These two composite parts have enabled a more standardised characterisation of BBa_J23106 when used in conjugation with a strong RBS shown to function in both Gram-positive and Gram-negative organisms, and the strength of BBa_J23106 can now be quantified using the iGEM 2018 interlab units of fluorescence, relative to the Interlab control plasmids, which will hopefully give future iGEM teams a more comprehensive understanding of its strength. We have also shown that this promoter has extremely low levels of activity in the Gram-positive organism C. difficile, and it’s therefore unlikely to be useful for other future iGEM teams looking to express genes in non-model Gram-positive organisms. BBa_ K1463773, BBa_ K1463772, BBa_ K1463770, and BBa_ K1463771 respectively. 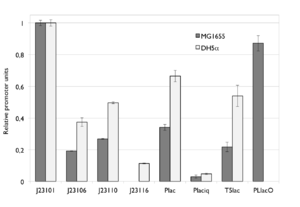 These composite biobricks were used to complement the swimming defect of a motA E. coli mutant. BBa_J23116 > BBa_J23106 > BBa_J23103 = BBa_J23112. Examination of the sequences of BBa_J23103 and BBa_J23112 showed that they are identical, despite showing different levels of RFP expression in their initial characterisation! This Anderson promoter was evaluated without fused RFP with the lux operon as a reporter in B. subtilis. See the new BioBrick BBa_K823008 without RFP and have a look at the Data from the evaluation in B. subtilis. 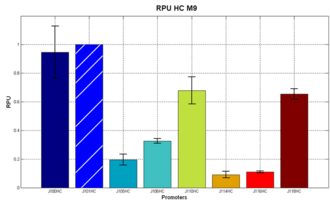 We used quantitative real-time PCR as a powerful tool for quantification of gene expression. We used this method to examine the expression rate of the Tar receptor gene under control of promoters from the Anderson family of the parts registry. The BioBricks (K777001-K777008) we used for this experiment can be found here. The reported activities of these promoters are given as the relative fluorescence of these plasmids in strain TG1 . Promoter constructs were cloned into the vector pSB1C3 and expressed in E.coli BL21DE3 grown in LB-media (lysogeny broth). The measurements were performed for each construct and reference as a triplet. Additionally, we included H2O as negative control to predict possible contamination. For the evaluation of our results, the 2–ΔΔCT (Livak) method was applied. We used the weakest promoter with the lowest expression rate as calibrator for the calculations and as reference the housekeeping gene rrsD of E.coli. You can find detailed information of the qrtPCR approach here. 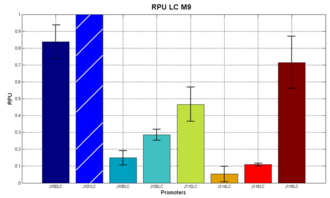 Comparison of relative expression rates of constitutive promoters by qrtPCR and relative fluorescence (see parts registry,Anderson family). 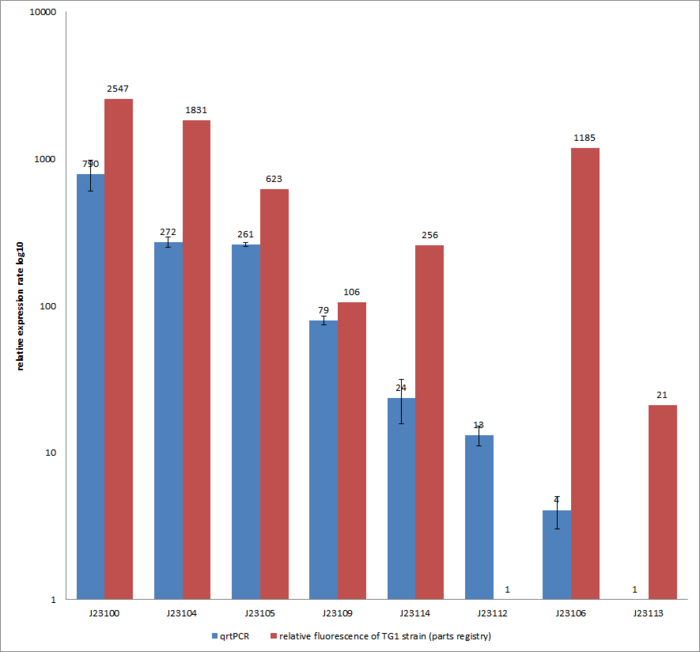 The blue bar indicates the measured expression rates for our constructs (J23100, J23104, J23105, J23106, J23109, J23112, J23113, J23114) and the red ones those for the literature values represented in the “parts registry”. The measurements are illustrated in a logarithmic application. The standard variation was calculated for our measured values (black error bar). For a more detailed description of our results click here. We used a number of the constitutive promoter family members for testing our biobricks. The constitutive promoters show the expected level of fluorescence when transformed into E. coli TOP10 cells. Placing parts behind the promoters turned out to be relatively straight forward. We used this part in combination with several biobricks for building our constructs e.g. BBa_I750016 and BBa_K190028 were placed behind the promoters. figure 1. The seven different combinations of double tandem promoters,from left to right, are J23106,J23102-J23102,J23102-J23106,J23106-J23102,J23106-J23106,J23106-J23116,J23116-J23102 and J23116-J23106. 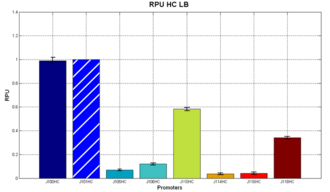 We use consecutive promoter BBa_J23106 as a basic part to construct tandem double promoters BBa_k1081003(J23102-J23106),BBa_k1081004(J23106-J23102),BBa_k1081005(J23106-J23106),BBa_k1081006(J23106-J23116) and BBa_k1081008(J23116-J23106). To start characterizing the promoters, we have performed the red florescence intensity measurements for our selected plasmid in the E.Coli MG1655 strain. The data collected is shown below. 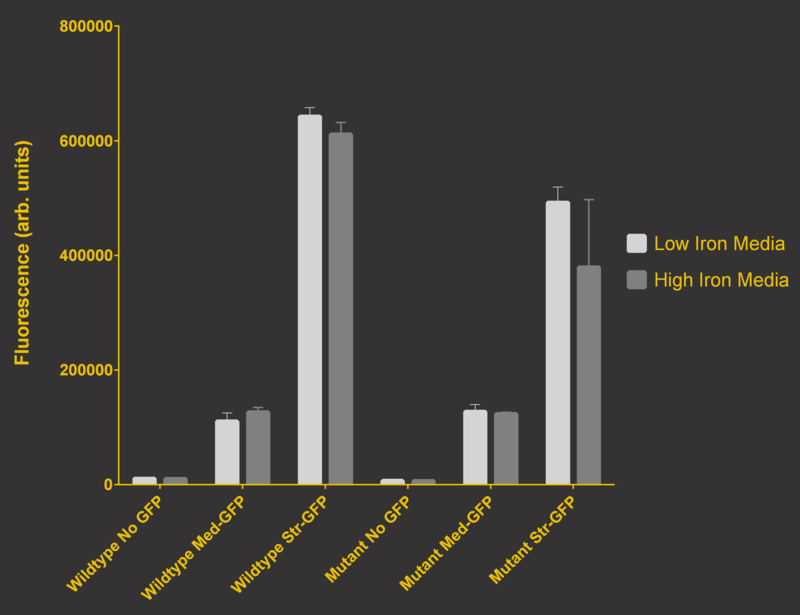 It is found that promoter J23106 can lead to a higher expression since the fluorescence intensity per OD600 is the highest, while J23103, J23109, J23116 have relative low expression and fluorescence. As our selected promoters have different strength, thus our team is able to use them to fine tune the protein expression. We used the part BBa_J23106 in the InterLab Measurement context. We assembled a measurement device by inserting the part BBa_I13504 amplified by PCR into the part BBa_J23106. The device was characterized in E. coli NEB10β, JM109, and NEB Express by measuring GFP expression with a cuvette-based spectrofluorometer, a fluorescence plate reader, and a flow cytometer. 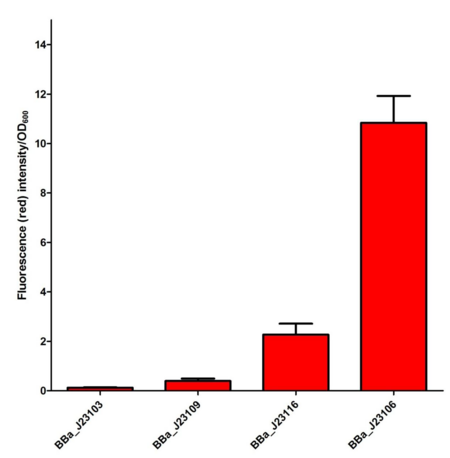 We also confirmed the promoter activity with a cell-free S30 extract system and measured mRNA by RT-qPCR.